Posted by Jill S. Schneiderman in Uncategorized. This piece is also reprinted at Truthout. As I’ve indicated here, here, here, here, and here, I’m not a big fan of Earth Day because I believe that every day should be Earth Day. But a recent article in Haaretz moves me to offer these thoughts on this inauspicious day. Have you read the story in the April 19, 2015 issue of Haaretz “Geologists: Road along Dead Sea coast must be diverted toward nature reserve“? It’s worth paying attention to if we aspire to work towards what theologian and historian of religion Thomas Berry referred to as the Ecozoic Era, a period in which humans and the Earth interact in a “mutually enhancing manner.” That is, a period in which all beings (human beings, non-human beings and the Earth itself) live together peacefully and in good health. Or, we could disregard lessons such as those taught by the encroachment of sinkholes from the Dead Sea coast toward the Judean Hills and move towards what the renowned entomologist, E.O. Wilson, at first called the Eremozoic Era and now speaks of as the Eremocene, the “Age of Loneliness.” “Eremocene”– the term moves me to feel bereft. Though I wish I felt otherwise, I believe we are on a path to the future of which Wilson warns. Expansion of sinkholes along the Dead Sea coast and proposed solutions are emblematic of the wrong approach to living with the planet and each other. Israel, a tiny country the size of New Jersey, clings aggresisvely to land that ultimately must be shared with Palestinians. And the country, apparently, is trying mightily to avoid losing ground literally in the form of sinkholes along its western edge of the Dead Sea. Sinkholes form sometimes where rock below the land surface is easily dissolved by groundwater. The dissolution causes cavities to form beneath the land surface. The cavities grow into caverns and become so big eventually that the land surface collapses into them. In Israel, adjacent to the Dead Sea the sinkhole problem is severe. Why? Ample freshwater flowing south from the headwaters of the Jordan River has been reduced substantially so that the Dead Sea receives only five percent of its historic water flow. As a result, this once massive water body is evaporating at a rapid rate of nearly three feet per year. But Israelis and Jordanians can only blame themselves. Excessive withdrawals for unwise agricultural practices in the watershed as well as political conflict with Syria at the confluence of the Yarmouk and Jordan rivers, (not by Palestinians in the West Bank whose access to water is severely limited by Israel’s Water Authority) together with diversion of water from the Dead Sea for resorts and the extraction of minerals from the briny sea to produce cosmetics and fertilizers has caused the surface of the sea to shrink by nearly 45% since the 1930s. Because the Dead Sea is drying up, decreasing levels of salt water allow fresh groundwater to well up and eat away at subsurface salt layers. Hence the sinkholes. 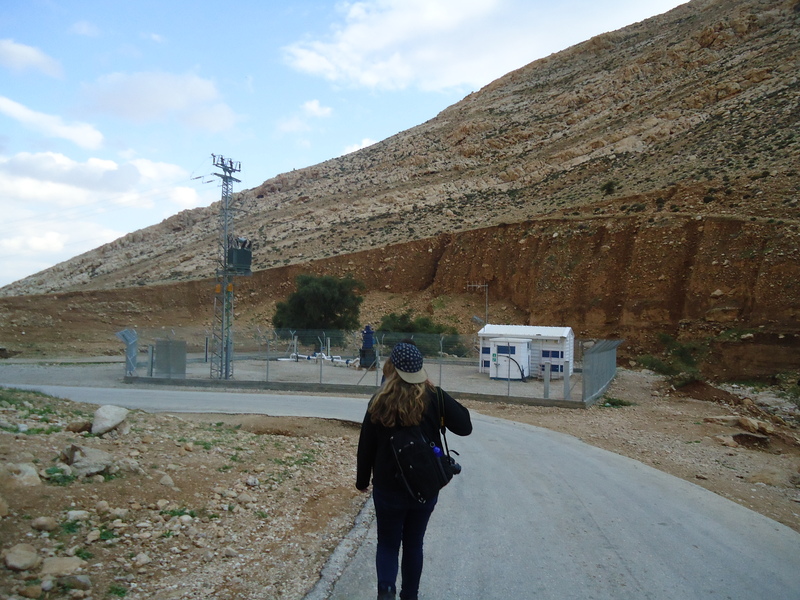 Palestinians in Auja, West Bank, showing Vassar students the source of their town’s water supply. Israel Water Authority water well tapping into aquifer. Auja, West Bank. 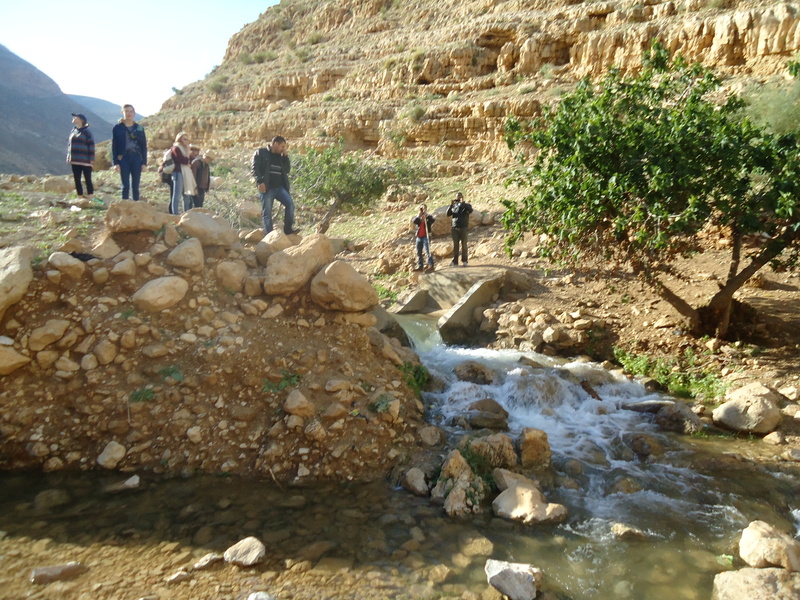 Last month, a substantial portion of the major north-south roadway connecting Eilat to northern Israel, collapsed between the Dead Sea and Ein Gedi, an oasis with abundant waterfalls in the desert. 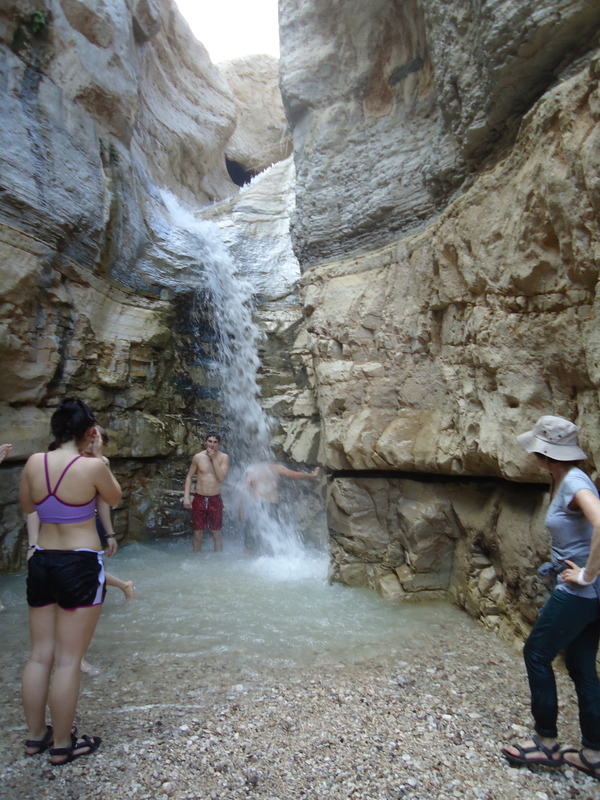 Vassar students at Wadi Arugot, an oasis near Ein Gedi, March 2014. The proposed solution? Build a road closer to the oasis to facilitate movement of residents and tourists in the area. Such action would displace bugs and birds, invertebrate species, not to mention the “charismatic megafauna”– ibex, hyrax, wild boars, desert cats, hyenas, jackals, and wolves–that drink from the fresh water pools in the oasis. Why not attempt to curtail the water mismanagement? Gidon Bromberg, the Israeli Director at EcoPeace/Friends of the Earth Middle East says that restoring water flow to the Dead Sea to at least 30% of its historic amount would be a step in the right direction. Though we may lose ground along the way, may we step off the road that leads to the Eremozoic Era and on to an awakened path that leads to the Ecozoic one.